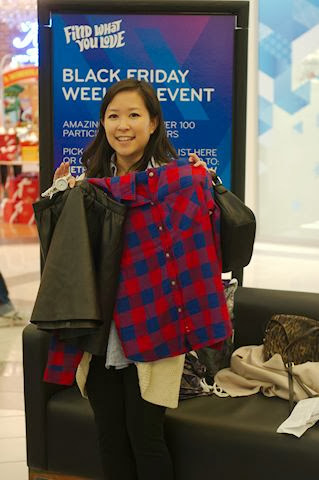 Yesterday was the my first time shopping at Black Friday and my first time shopping competitively in the Black Friday Fashion Blogger Challenge, hosted by Metropolis at Metrotown. 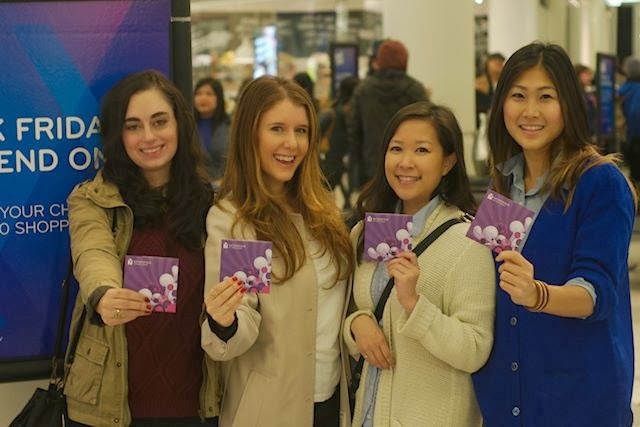 In case you didn't read the details in my earlier post this week, I and 3 other bloggers (Lyndi of Style Calling, Cee of Coco and Vera and Eudora of Modern Mix Vancouver) were challenged by Metropolis at Metrotown to see who could put together the best outfit, with the best Black Friday deals with just $100 and an hour and a half of shopping time. Such a fun idea right? I have to admit, I was quite into the whole competitive aspect. Although I'm pretty laid back in most things, a game always bring out my competitive side. I've tried to downplay my competitiveness over the years as when I was a child, I would cry if I couldn't even get to go first! So, I have to admit that I did a little mall scouting beforehand and planned out a vague idea of what I wanted to go for. I knew that I wanted to get an outfit that reflected my trendy, yet casual and downtown vibe of dressing, so of course that meant one thing: leather. 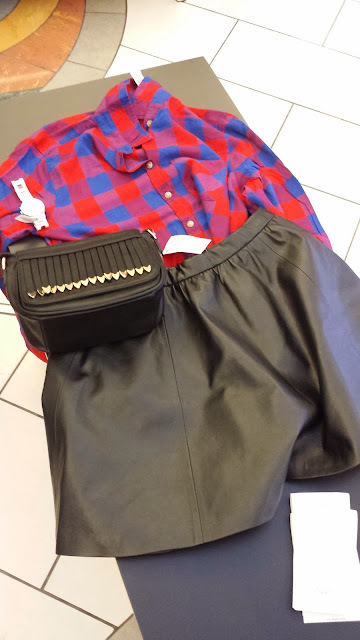 Knowing that H&M had a very cute a-line leather skirt, I based my outfit around that and paired it with a soft, bright red plaid shirt (40% off!) from American Eagle and a white jelly watch (also 40% off and from American Eagle). Then I accessorized with a black purse from Aldo, which had these great little silver shingles on it and was a steal at just $8!! Since I was so single-minded with my shopping, I finished with just $2 leftover and 45 minutes to spare, so I picked up a couple other items out of my own pocket: a bright green clutch/cross-body purse from Forever 21 and a pair of cozy loafers lined with fur from Aldo Accessories. After our time was up, it was time for the judging. 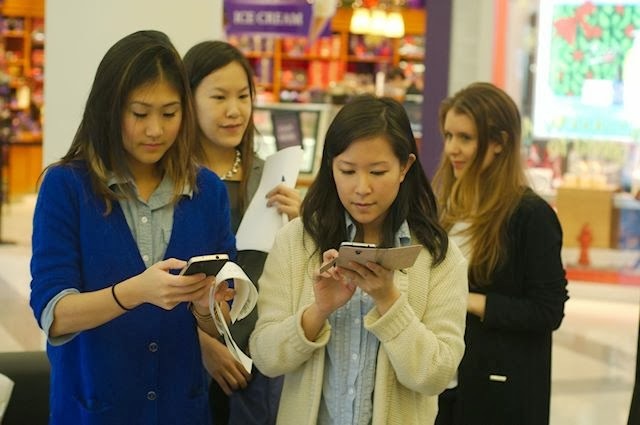 Vanessa, Metropolis at Metrotown's Social Media Manager and another colleague from Metrotown, were our judges. 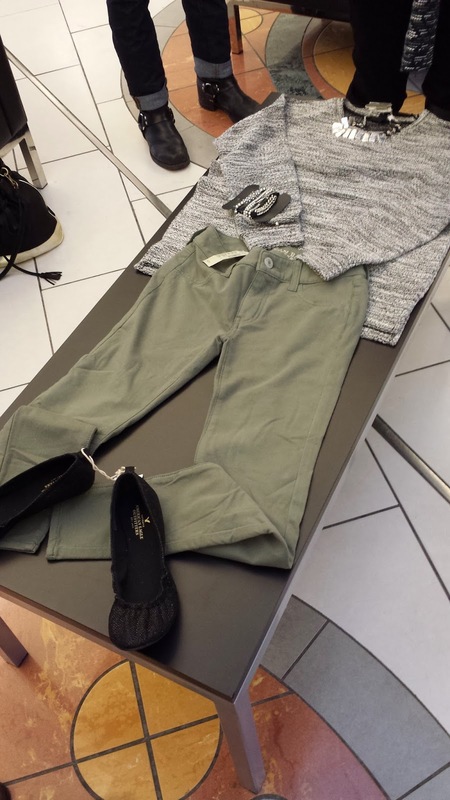 Each outfit was scored based on style, savings obtained and number of stores visited. I was seriously impressed with each girl's outfit as we all managed to put together a complete outfit, some even with shoes! Cee's outfit was my favourite (after mine of course!). Her outfit totally matched her style and looked very polished and elegant. 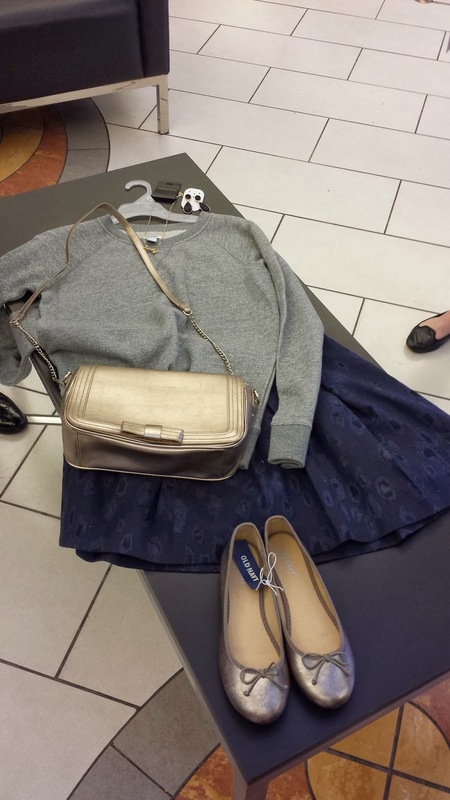 Cee's outfit consisted of items from Gap (sweater, skirt? ), Old Navy (shoes), Forever 21 (purse) and Aldo Accessories (jewelry). My outfit as I mentioned, went for more casual, trendy vibe. Leather and 90s touches like plaid shirts are big right now and I liked the chunky look of the white watch as a fun accessory piece. The only thing I was missing that I think would really have topped this outfit off is if I had enough funds left to purchase a matching toque! Eudora's outfit was a great mix of casual items elevated by a few key accessories. I loved the print of the sweater she chose and would totally wear this outfit in a snap. Eudora's outfit was made up of items from Costa Blanca (accessories), American Eagle (shoes). Lyndi's outfit perfectly encapsulated her professional, effortless look. Lyndi did a great job pairing various print and textures together into one cohesive outfit. Lyndi's outfit was made up of items from Aldo Accessories (earrings), Old Navy (skirt and sweater?) 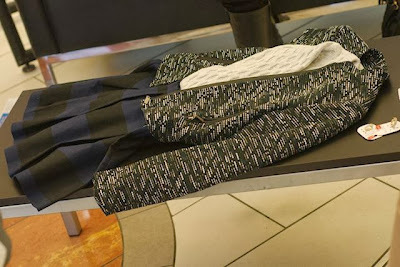 and H&M (jacket). In the end, our judges had a very tough decision on their hands, but I totally agree with their decision, which was to crown Cee as the winner! As the winner, she received a $200 gift and we all received our outfits and a $50 gift card to giveaway! Thanks so much to Vanessa and everyone at Metropolis at Metrotown for hosting this giveaway and for inviting me to the challenge. 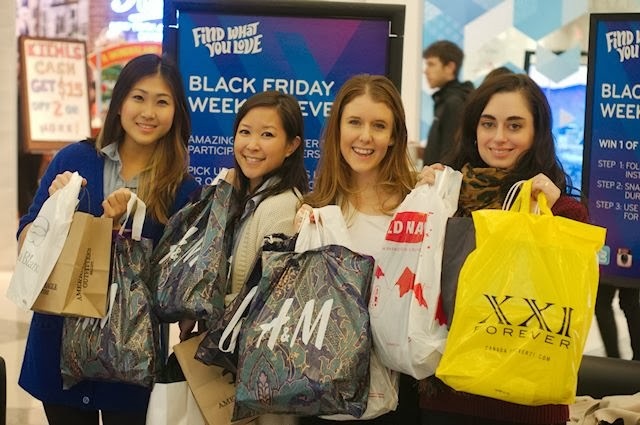 You still have time to check out all the Black Friday shopping deals and you can see the full list of participating stores online here.